Heat the oven to 350F and spray a 9×12 pan with non-stick cooking spray. In a large bowl, mix together the brownie mix, eggs, water, and oil. Stir until well mixed. Spread brownie mix into the pan and bake for 22-25 minutes or until a toothpick inserted in the middle comes out clean. Then cut into squares or rectangles. Use the cookie frosting to “glue” three pieces of candy in a triangle shape. 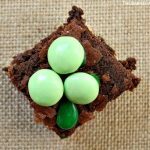 If your brownies are large, you might be able to make four leaf clovers instead of three leaves! Then use the frosting to draw a stem on your shamrock.